Drying flowers with glycerin, or glycerinizing, is the process of preserving plant materials by replacing their natural water content with glycerin. This method is particularly suited for preserving stems and foliage, rendering them softer and more pliable than most other drying processes can. The bonus is that these materials will also last longer. It’s a good idea to collect more plant material than you think you’ll need for your project to allow for any damage that might occur during the drying process. Collect flowers and other plant materials early in the morning, when they’re fully hydrated. Cut blooms that are fully open but not wilted. Look for stems, branches and foliage with attractive curves and bends that might offer variety to your arrangements. Choose bug-free materials completely free of disease, damage and blemishes. Combine 2 parts hot water with 1 part glycerin in a tall glass container. Make enough solution to cover the lower 2 to 4 inches of the stems. Stir to mix well. Mark the fluid level on the outside of the container. Remove leaves that are situated low enough on the stems to be submerged by the glycerin solution. Split or crush the ends of woody or extremely fibrous stems. Place stems in the glycerin solution for one to three weeks. Colors will darken somewhat as plant materials absorb glycerin. Combine 4 parts warm water with 1 part glycerin and mix well. Use this to replace the glycerin solution as the level in the container decreases. Keep the level constant. Remove stems from the glycerin solution when they become soft and pliable. Set them in a colander to drain for a couple of hours. Cut off the ends that were soaking in glycerin. 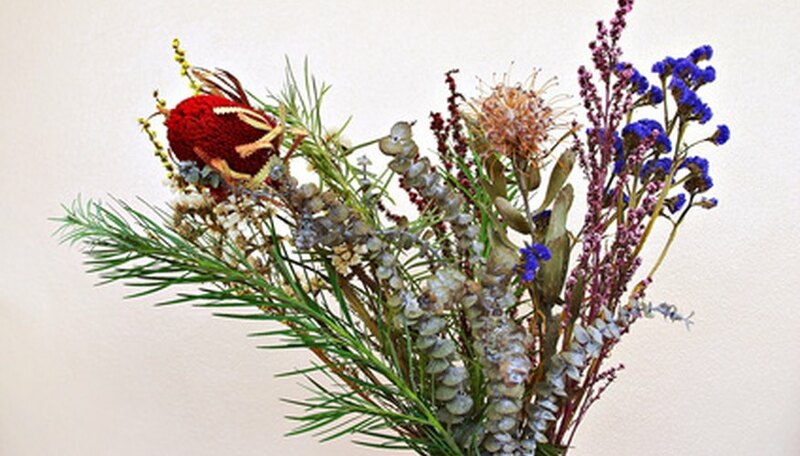 Gently wipe your glycerinized flowers and foliage dry with a soft cloth. Spread the plant materials out in a single layer on paper towels and place in a warm, dry spot for about a week to air before using them. You can substitute automotive antifreeze for the glycerin.